Industry veteran brings wealth of experience in e-commerce, global ERP, to role as vice president of client experience for HotWax Systems. "Patrick's extensive e-commerce experience, expertise in global ERP, and superior leadership skills, make him the perfect choice for this role." 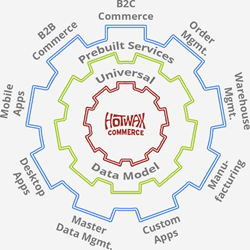 HotWax Systems, global leader in Apache OFBiz and creator of the HotWax Commerce enterprise commerce platform, is pleased to announce the appointment of Patrick Gibbons as vice president of client experience. "In this role, Patrick will oversee all aspects of client interaction with a focus on delivering value, exceeding expectations, and driving client satisfaction," states Mike Bates, founder and chief executive officer. "Patrick's extensive e-commerce experience, expertise in global ERP, and superior leadership skills, make him the perfect choice for this role." Gibbons joined HotWax Systems as director of business development in 2008, with an impressive record of successfully managing several early stage technology companies. He has managed multiple large-scale projects and has an in-depth knowledge of both the HotWax Commerce platform and Apache OFBiz. Gibbons holds a B.S. degree in Finance and an M.B.A., both from the University of Utah. He has served on the boards of the Children’s Service Society of Utah, the Henry’s Fork Foundation, and the YMCA of Northern Utah. "In my tenure at HotWax Systems, I've been lucky to work with many great people and companies as clients and to play a role in their success," comments Gibbons. "I'm excited to be part of this dynamic team as we continue to focus on providing top level products and services in an ever evolving digital world."